It's Monday--Picture Books Past. Well, recent past--40 years, to be exact. 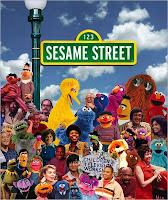 Sesame Street has had a huge impact on children's media. Just think of the countless books it has spawned over the years. The Brooklyn Public Library is having an exhibit celebrating Sesame Street's 40th. Look at some pictures of the exhibit here. Check the news coverage below.